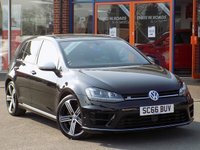 Finished in a stunning Deep Black Pearl this stylish DSG Golf R delivers on appearance, performance and all round driving experience. Comes well equipped and has Full Volkswagen Service History (1 stamp) Its specification includes the Panoramic Glass Sunroof along with Discover Navigation, Adaptive Cruise Control, Bluetooth, 2 Zone Climate Control, DAB Radio, Front and Rear Parking Sensors, Bi Xenons, Folding Door Mirrors with Puddle Lamps and 18" Cadiz Alloys. Please ask for details of our fantastic finance and warranty packages, subject to status, T's and C's apply.